This monument sits across from the Depot in Leary. It’s dedicated to Phillip Edward Boyd, and the inscription says “33 Years Dedicated to Leary 1878-1908”. I know that Boyd was a decorated Civil War veteran, but that’s about all I can find. If anyone has anymore information it is greatly welcomed! 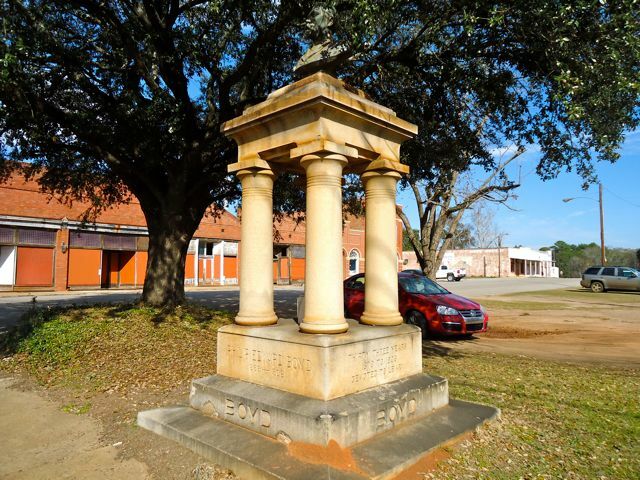 This entry was posted in Leary and tagged Calhoun County, Cultural Feature, Incorporated Town, Leary, Memorial. Bookmark the permalink. This monument used to sit in the middle of Main Street at the end of Hotel Street. I remember having to go around it. My mother once told me that the people of Leary wanted a statue for downtown and thats who they picked. She didn’t know why though.